Shani Davis still has the fire inside, perhaps as much as ever. Coming off a challenging season in which he earned only one World Cup medal, the two-time Olympic Champion and 10-time World Champion is aiming to finish with a flourish as he approaches the home stretch of one of speedskating all-time great careers. 1. What motivated the decision to train in S Korea for the summer? And how did it benefit you? SD: I wanted to rekindle some of the earlier training I had with my Korean coaches so I went back to the motherland of short track! I wanted to cover all my bases and challenge myself with some of the young and upcoming Korean superstars of short track. It was a bit outside of my comfort zone but having to adapt to the demands of their training was something I needed to jump start my fitness and push myself to regain some of those components I lost over the seasons not working with the Korean coaches. I enjoyed being able to immerse myself in the Korean culture and train in where the next Olympics are going held, to be able to challenge myself in a different environment. It was a wonderful experience. 2. What team will you be racing with this season? SD: I joined the Japanese Nidec Sankyo Team as a coach-skater. 3. How do you approach this pre-Olympic season differently than last season? SD: Any ideas or strategies I’ve developed over the years or seasons, I can try this season so next season I will have a solid plan without doubts or fears the I’m doing the right things or not. It’s super important for me to build myself up in areas I fell short in the years before and see how I measure up with the world after making the changes and things like that. I’m very excited for the season to begin so I can truly see my improvements or weaknesses and see what I have to do next to get me back where I ultimately want to be. 4. What are some of your technical or physical goals this season? Do you have results-based goals? SD. Just to make things simple and not have to work too hard at things that I used to do naturally. At the moment I’m trying to get back to skating with my all-around technique so I have the overall fitness with good speed and endurance, just trying to re-calibrate those two things and not let one become too much stronger than the other. If I can improve on my opening speeds in the races and have a stronger middle and last lap in both the 1000 and 1500 it will be a clear indication that I’m heading in the right direction. 5. 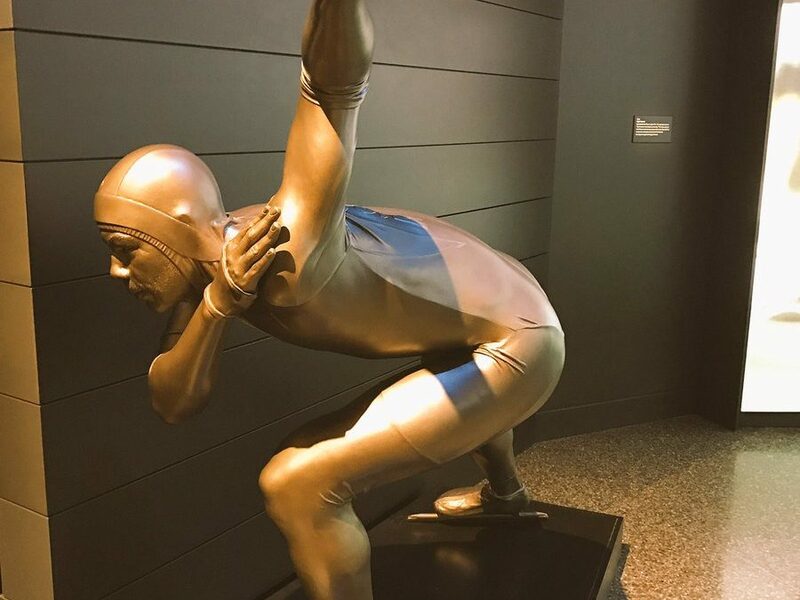 You were recently immortalized with a life-size statue in the NMAAHC on the National Mall, alongside some of sports – U.S. – history’s most iconic athletes. Where does this rank in your pantheon of honors? SD: It’s such a honor to have my own statue, my own personal figure, along the other greats of sports and history making individuals. I guess it hasn’t really hit home yet but I’m waiting for the day I can see it in person and take in the moment. I would have never have thought my efforts and hard work would have ever led to being immortalized and honored in such a way. Long after I’m gone with skating and competing that figure will still be there. My legacy will be forever!! 6. What will determine whether you succeed this season? SD: Any general improvement in comparison from the past seasons I think would be a success. Just getting closer to that feeling I’ve been searching for would be huge to me, motivating in the sense that all the training and the decisions I’ve made were somewhat correct and that will fuel me on to continue and work hard to finish up my career. 7. There is some evidence that the Under Armor suit from the 2014 Games was indeed defective. Any comment about that? SD: Yes, test results showed the Mach 39 suit to be defective. Both Ethics Committees at USS and the USOC have this documentation and are addressing this issue.